A new paper in Tectonophysics deals with the use of terrestrial LiDAR for identifying the slip vectors on fault planes. 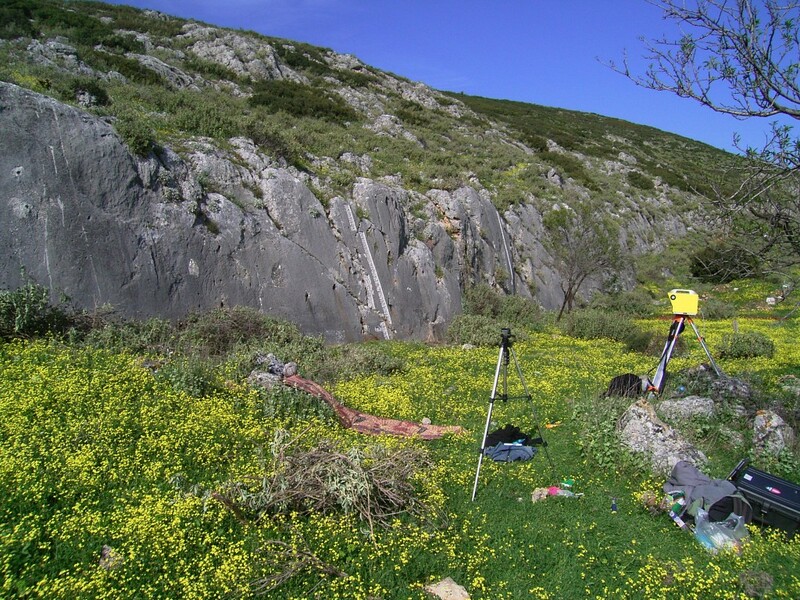 Thomas Wiatr, Klaus Reicherter, Ioannis Papanikolaou, Tomás Fernandez-Steeger and Jack Mason collected and processed data from Crete island (Greece), where they scanned the scarp of the Spili Fault. They imaged numerous kinematic (slip direction) indicators like slickensides with this relatively new technique. The t-LiDAR data were then compared to traditional compass measurements in order to get an idea about the derivation betwen old-school measurements and high-tech methods. The terrestrial LiDAR in front of a limestone scarp in Greece. It’s not the Spili fault scarp on Crete, but the Kaparelli fault scarp near the eastern tip of the Gulf of Corinth. The authors demonstrate that t-LiDAR is a powerful tool for paleoseismologists and structural geologists and that it is precise enough to map kinematic indicators on fault planes even from the distance. This could be especially usefull in mountainous areas and rockfall-prone sites. Wiatr, T., Reicherter, K., Papanikolaou, I., Fernandez-Steeger, T., and Mason, J. 2013. Slip vector analysis with high resolution t-LiDAR scanning. Tectonophysics, in press, http://dx.doi.org/10.1016/j.tecto.2013.07.024.